STEPHANIE NAKASIAN is one of the most versatile singers out there. She can do cabaret, trad, swing, bop and vocalese - just about anything you want - and is great at tailoring a show to your desires. 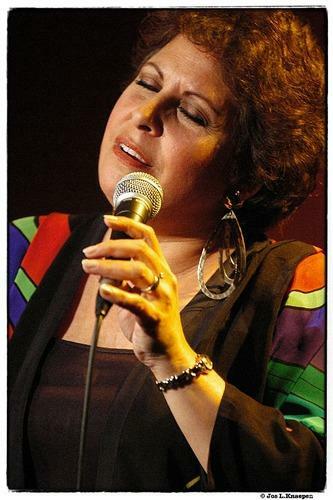 Drawing on her considerable knowledge of the vocal tradition and a vast repertoire of songs, she does a lot of theme shows, such as Great Ladies of American Song and tributes to Mercer and Mancini, among others. Stephanie's CD, Billie Remembered, received excellent reviews, and inspired Terry Gross to interview Steph on her award-winning NPR program Fresh Air. Stephanie has done her big band June Christy tribute all over the country, most recently at the San Jose Jazz Festival, with the San Jose Jazz Orchestra using the original charts Pete Rugolo wrote for June with the Kenton orchestra. Her newest CD Show Me The Way…to get out of this world is on the Capri label and they've been great with promo support for her live dates. Steph is also a master teacher, and her new book You Already Know How To Sing: Voice Lessons, Life Lessons, is a must-read for aspiring vocalists and for vocal instructors. Also see Special Projects.